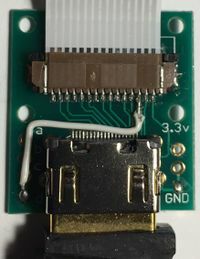 It is possible to use an HDMI cable to extend the lead on the Pi Camera CSI-2 connection, but some lower quality HDMI cables will not work (and do not allow the camera to start up) without modifications to the Tindie connector cards https://www.tindie.com/products/freto/pi-camera-hdmi-cable-extension/. This is because some cables do not include the ground/shield connection for the 4 data pairs, and some do not include a wire for the Consumer Electronics Control (CEC) channel on pin 13. The first modification uses the overall cable screen to replace the non-existent data pair screens. To make this modification, simply use solder to bridge the 2 rectangular pads above to the "GND" caption on the right hand side of the HDMI socket. 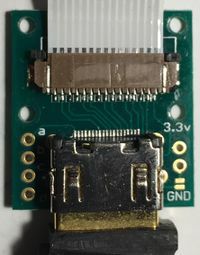 Thanks to Tindie and his blog http://petitstudio.blogspot.co.uk/2015/05/hdmi-cables-are-not-all-same.html for this modification. The second modification uses one of the spare cores (labelled a, b, c and d) instead of the possibly non-existent Pin 13 CEC core. 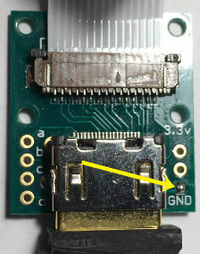 This modification requires a fine soldering iron and a magnifying glass to solder a wire between pin 13 on the CSI-2 flat cable connector (coincidentally connected to pin 13 on the HDMI connector) and the round pad labelled "d". Use a test meter to check that you have not created a solder bridge to pin 12 or pin 14 after making this modification. I chose the "d" pad because this is a data wire in the normal usage of HDMI. The unmodified board, and the 2 modifications are shown below. The HDMI pins are numbered from 19 on the left to 1 on the right in the images. The CSI-2 connector pins are numbered from 1 on the left to 15 on the right. The detailed pinout is below for reference. This page was last modified on 10 July 2017, at 14:53.